GGULibrary is one of more than 5,000 organizations on LibraryThing. About meThe Golden Gate University Business Library provides resources, programs and services in support of the educational needs of all University students, faculty and staff. Alumni may purchase yearly book borrowing privileges & use databases on-site. 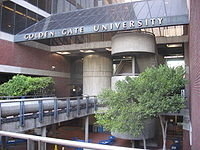 About my libraryFounded in 1901 in San Francisco, Golden Gate University (GGU) meets the needs of working adults by offering undergraduate and graduate programs in business and management, information technology, taxation, and law.